The New Mexico Center for Particle Physics together with the Nuclear Physics, Astrophysics, Particle Physics and Cosmology/Inflation groups bring a diverse yet synergistic research focus to the Department of Physics and Astronomy at the University of New Mexico. While encompassing a large number of both theoretical and experimental efforts, the techniques and underlying physics are sufficiently overlapping to create a large internal collaboration within the department that brings excellent seminars (every Tuesday), provides for theoretical guidance to graduate students, and enhances our experimental facilities through knowledge and equipment sharing. 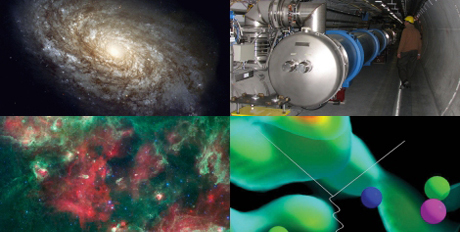 The eight associated faculty have diverse research programs including : Nuclear Physics, High Energy Physics, Dark matter and Particle Astrophysics experiments, New Detector Development, and theory/phenomenology on Neutrino Physics, Dark Matter Physics, and Cosmology/Inflation. Many of the research program are in close collaboration with research groups at nearby Los Alamos National Laboratory (LANL).